The above info came from Steph A., and was edited by yours truly (contact me). The image came from photobucket.com. 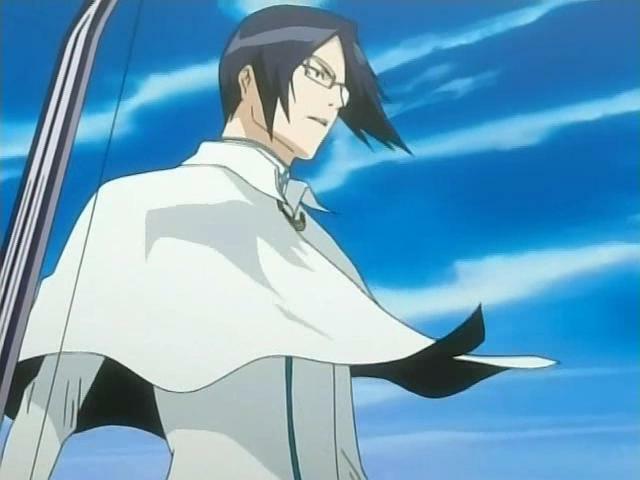 Ishida Uryuu is one of the main characters in Bleach. He is in a bloodline named 'Quincys'. When he is first introduced he is distant from everyone. To keep himself busy he's in a sewing club. Once he finds out Ichigo is a Shigami he feels that it's his 'destiny' to defeat him. And the reason for this? Even before he was born, the Quincys were regarded as other soul reapers until it was learned that the Hollows they destroyed weren't purified, just disapeared, and apparently that would have led to the apocolypse. So the Soul Society casted a law stating that all Quinceys must be destroyed. Many of them died and then they were taken back to Soul Society to be experimented on. Once he is born and old enough to learn about the Quincy heritage he wants to become one. When his grandfather finds out, he is happy that someone wants to continue their bloodline. When his father finds out, though, he says 'no' right away. When Ishida asks him why he says that he should become a doctor and forget about being a Quincy. Ishida is then heartbroken and runs to his grandfather. His grandfather says he should listen to his father, but Ishida wants to learn his Quincy powers more than anything. His grandfather then agrees and teaches him in private. After Ishida learns his Quincy powers and perfects them, his grandfather gives him a box, but tells him not to open it until he's ready. Shortly after, Ishida sees his grandfather killed by Hollows and taken away to Soul Society. Thet Shigami were standing by and allowed the Hollows to kill him. That's when his hatred for Shigami starts. He later on becomes friends with Ichigo and the rest of his friends. When Rukia gets taken back to the Soul Society by Byakuya and Renji, Ishida agrees to help out Ichigo to save her life. That is when he pulls out the box his grandfather gave to him and learns his even more powerful Quincy powers. Now what he wears is a blue and white outfit with a matching glove. While in the Soul Society he meets the man who killed and studied his grandfather, 12th Squad Captain, Kurotsuchi. He vows to kill him and almost gets away with it, if it wasn't for Kurotsuki almost killing him. Ishida remembers his grandfather's words about this new power he had. His grandfather clearly said never to break the little stem part of the glove. If he did he would lose his Quicny powers forever. To help his friends Ishida must betray his grandfather and break off the stem. As he does he gets unbelievable power. After the battle, Ishida can feel his powers leaving him. After he and all his other friends save Rukia and leave the Soul Society, he keeps quiet about his powers being gone. He's able to keep quiet about his powers being gone for a while, until people called 'Bountou' come along. 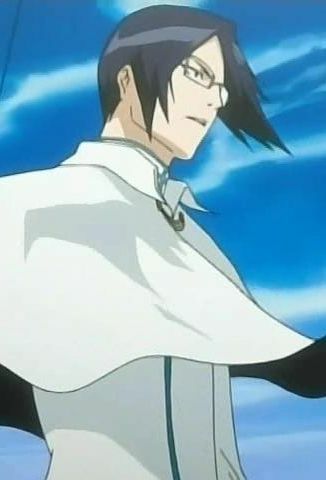 The leader Kairya Jin tells Ishida, Ichigo, Inoue, and Chad that the Bountou need a Quincy to get into Soul Society. The first Bountou to find out Ishida lost his powers is a female Bounto named Yoshino. Yoshino is later killed by Kairya Jin, since she betrayed the Bountou clan. Ishida vows to get revenge for her death. After that, almost every night and day Ishida works to get his powers back to defeat Jin. Kurotsuki then sends his Vice Captain, Nemu, to Earth to give Ishida a little present. What Nemu gives Ishida is a bracelet that enhances a Quincy's power, or in Ishida's case restores his powers. But unfortunately it's only temporary. When Ichigo fights Kairya Jin to stop him and the rest of the Bountou from getting into the Soul Society; Ishida comes along and helps them get in. He does this because he believes that Jin will be more vulnerable there. The above description came from Steph A., and was edited by yours truly (contact me).